Approved as "The Official QB78 Family Website" by the manufacturer, Shanghai Air Gun Factory, Archer Airguns is the one stop shop for all your QB78 family needs. Archer Airguns dares to be different. It concentrates entirely on a limited range of Chinese airguns - primarily the QB78 family - it is THE specialist one-stop shop for these rifles. We believe that every customer is unique, and know that every gun is unique too. Here you can discover information, specifications, performance details and advice which would otherwise take you months of time and effort to uncover. Here you can buy a plain "vanilla" gun, or you can choose a full custom rifle tailored exactly to your specifications. Here you can choose from a large range of specialist services all in one place, most of which are unavailable from any other airgun supplier. Here you can know exactly the performance of your air rifle, its average muzzle velocity is with a particular types of pellets, its muzzle energy, how light is its trigger pull and more: all simply by ordering the appropriate services. Here you can be sure that when you buy a sling, a scope or any other accessory, it actually will fit your air rifle. How do we know? We only sell what we have tested and proved to work! Here you will receive warranty support on the air rifles you buy from us, in the unlikely event that it is necessary. And spare parts? Surprise! Here you will find them too. Here you can be confident in what you are buying, confident that the services you specify will be performed in a professional fashion and timely manner, and confident in the quality of service you receive. Our service will make you confident that your order has been received and when it is despatched, and if there is a delay, be confident that you will be told and informed of progress. Archer Airguns is not a soul-less "supermarket" with a huge range of products which the staff don't understand. This is a place where dedicated people work hard to understand every aspect of our range of products and services. We want to be successful and know that this success will result if we exceed your expectations at every possible opportunity! Archer Airguns is owned by Cornelia and Stephen Archer. Below. 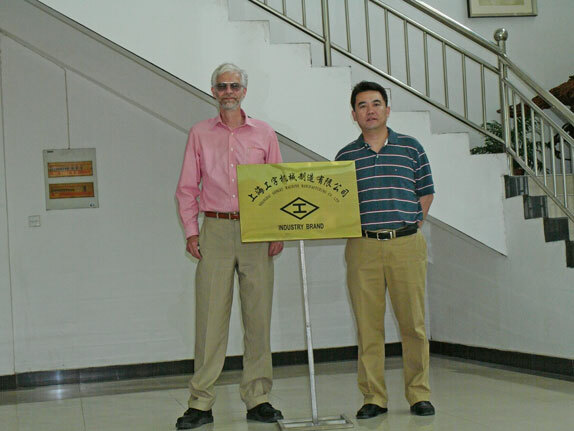 Stephen Archer (left) with the VP of Sales at the Shanghai Airgun Factory in China. Stephen is a long-time shooting enthusiast who has discovered airguns only in recent times - and then became hooked! Until his QB78 came upon the scene, Stephen had shot full power, military bolt-action rifles for many years - mainly Lee Enfields, Kar 98k Mausers and a very fondly-remembered Mosin-Nagant Model 1891/30 Sniper Rifle at all ranges from 100 to 1,000 yards. Cornelia remembers being introduced to firearms at an early age by her Father, who collected hunting rifles. She is a crack shot with a FN-FAL, just so long as it has a bipod and she can shoot prone: otherwise full power battle rifles are a little too heavy for her. But the QB78 is just fine! Archer Airguns is our joint project and the culmination of many years research and planning. Fairport, New York can lay claim to be the "spiritual home" of CO2 cartridge-powered airguns. For in the 1950s and '60s, Crosman Arms was based here and many famous airgun designs originated from that factory during those years. These included the Model 160 and 167 "Pellguns" which - as is well-known - formed the prototype for the QB78. The CO2 "Powerlet" as we now know it was first developed at the Fairport site, too. Crosman Arms is now based a few miles away in the village of East Bloomfield. Can I visit Archer Airguns? Archer Airguns is an Internet-only business. We have no physical storefront, but try very hard to present an informative, service-orientated and "human face" to the World. This website is the only place you can visit us! Because we like them! It's as simple as that. There are many more expensive, more complicated and more powerful air rifles, but the QB78 is just a beautiful little gun. Classic design like this never goes out of fashion! Email us at Sales@ArcherAirguns.com to tell us what you liked about your purchase, how much you are enjoying your new airgun, or what Archer Airguns could do to improve its service. If you have a question about your QB78 which is not covered by the information already contained in this website, please ask and we will try to provide an answer. Tell us also what other products and services you would like Archer Airguns to offer in future. We will investigate all suggestions, and if the idea has potential we may even ask you to be part of our development team testing the new product or service! Although these services are undertaken as rapidly as possible, unfortunately we cannot guarantee next day turnaround. But, we want you to be a satisfied customer and so will let you know if there is likely to be a delay of more than one week in being able to satisfy your order. If there are other services which you would like for the QB78 but are not currently listed, please contact us with a suggestion. We will investigate whether it could be possible for Archer Airguns to offer your suggested service!